Astrology Should You Let The Stars Guide Your Life? Are you "Capricorn" or "Scorpio"? Should you avoid strangers today? Should you contemplate marriage? Are you and your pet dog or cat compatible? Is this a bad day to put a new idea to work? Should you postpone trying to overcome a bad habit? What do the stars and planets indicate? Millions of people daily check their horoscopes to find out. Contracts are signed, employees hired, business ventures started, lifestyles changed, occupations chosen, friendships altered, diets formulated, bets made, trips planned, babies named - yes, sometimes, government policies and political decisions arrived at - all based on astrological readings. Even if you yourself do not believe in astrology, you may still be directly or indirectly affected because of the decisions others in all walks of life make under the influence of zodiac charts. Briefly put, adherents claim astrology is a method of anticipating or foretelling events by calculating the effect the sun, moon, stars and planets have on human activities. Supposedly, the relative positions of the heavenly bodies at the moment of a child's birth influence the child's character and personality. Plotting the movements of those heavenly bodies, it is thought, will reveal an individual's destiny. As to whether astrology really works, the debate has been intense. A few years ago 186 eminent scientists, among them 18 Nobel prize winners, signed a declaration that there is no scientific evidence to support astrology. Armed with this and similar statements made by other scientists and astronomers, many have sought to debunk it. On the other hand, devotees and practitioners respond, "Don't knock it if you haven't tried it!" They insist the principles work regardless of certain charlatans and fakes who have given the study of astrology a bad name. And so the arguing goes on and on, some claiming there is nothing to astrology, others insisting there is. Numerous books and papers have been written giving both sides of the story. There is no need to go into all the arguments here because they are voluminous and inconclusive. Psychology Today (February, 1976) focused on the crux of the matter when it referred to the conclusions of science writer Lawrence Jerome: "Arguments against the irrationality of astrology's claims miss the point, he says, because astrology isn't based on science or logic. It is a system of magic... Astrologers since Greek times have tied their art to whatever scientific facts came to hand, Jerome said, 'more and more ascribing astrology to physical influences and obscuring the magical principles upon which it was based.' But the basis is still magic" [emphasis ours]. The Bible concurs. It groups astrologers along with magicians and soothsayers (Dan. 1:20, 2:2, 10, 27, 4:7). But just because they may at times work does not mean God's people ought to become involved with them. The source of these powers is definitely not God. Christians Celebrate Birthdays?" 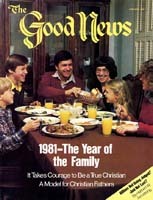 in the May, 1980, Good News) ought to make any true Christian suspicious. The heathen were the first ones to look at the heavens and to react to portents they thought they saw. However, God commanded His people, "Thus saith the Lord, Learn not the way of the heathen, and be not dismayed at the signs of heaven; for the heathen are dismayed at them" (Jer. 10:2). Isaiah prophesied that even though astrologers originated in Babylon, they would be unable to help Babylon in its time of trouble: "It was your magic craft and cunning that misled you . . . Therefore shall evil assail you ... Go on with your spells! Practice all your magic arts [notice once again the connection with magic]! … You have worn yourself out with them all; let the astrologers come forward now, let the star-gazers save you now, who calculate the future, month by month! They fare no better than the straw burned by a fire; they cannot save their own lives ... and there is none to save you" (Isa. 47:10-15, Moffatt version). There are numerous biblical condemnations of those who "observe times," as an astrologer must do (Deut. 18:9-14), those who worship "the sun, and the moon, and the stars" (Deut. 4: 19, II Kings 23:5) and those who serve the "host of heaven" (II Kings 17:16, 21 :3). Of course, many adherents of astrology protest that they are not worshiping and serving the heavenly bodies. Maybe not according to their definition of "worship and serve." But people do obey their horoscopes, and the Bible warns, "to whom ye yield yourselves servants to obey, his servants ye are to whom ye obey" (Rom. 6: 16). For many, astrology is indeed a "religion." "We are modern priests," one practitioner declared, "clearing up people's doubts about the way their lives are going." God intended that the heavenly bodies be used by man to measure time and seasons (Gen. 1:14). He did not intend that they be looked to for guidance in making decisions and evaluations in our personal lives. We have God's written laws for that. "Thy word [not the sun, moon, planets, stars or horoscopes, palm readers, crystal- ball gazers, diviners, mediums or fortune tellers!] is a lamp unto my feet, and a light unto my path" (Ps. 119:105). Of course it is evident that the sun and moon wield considerable physical influence upon the planet earth, both for good and, potentially, for harm. But Psalm 121:6 promises the righteous, "The sun shall not smite thee by day, nor the moon by night." However, no scripture speaks of the remote influence of distant stars and planets. And certainly no scripture tells us to look to the heavenly bodies for personal direction! The heavens declare God's glory (Ps. 19:1-6). But wisdom" guidance, understanding and the forming of an individual's character come from the laws and statutes of God, not from signs in the skies (verses 7-11). We are to judge others "by their fruits" (Matt. 7:20), not by their horoscopes. "Judge not according to the appearance," Jesus declared, "but judge righteous [according to God's laws] judgment" (John 7:24) . We are not forced to suffer, throughout life, from certain character weaknesses merely because we were born when the planets and stars were in a particular configuration. Through effort, with the power of God's Spirit, personality traits can be changed or overcome. "The spirit of the Lord will come upon thee, and thou shalt . . . be turned into another man," Samuel prophesied to Saul (I Sam. 10:6). When God's Spirit works with a person he takes on a whole new nature (II Peter 1:4). Regardless of his horoscope! Our minds were given to us so we can weigh facts and come to our own conclusions. Many of those who con- suit their horoscopes daily are really trying to avoid the responsibility of decision making. They want to be told what to do. They feel more secure that way. The American Society of Psychological and Social Studies made this point: "Faith in astrology is harmful, for it encourages an unhealthy evasion of the permanent problems of real life .... The astrologers, who offer the public a horoscope, which takes the place of conclusions drawn from serious reflection, are guilty of encouraging the human tendency of choosing facility rather than the difficult way." Why do millions eagerly refer to their horoscopes every day? Because they feel a need for something to guide them through the complexities of life. Something they can look to for direction. We as God's elect have a guide that never fails. Jesus promised that "the Spirit of truth ... will guide you into all truth" (John 16:13). Before making a decision, a Christian does not have to be concerned about whether or not the planets are in a favorable position. He needs only to be concerned about what God's law says. Then he can make his decision with confidence. "Receive, I pray thee, the law from his mouth, and lay up his words in thine heart... Thou shalt make thy prayer unto him, and he shall hear thee ... Thou shalt also decree a thing, and it shall be established unto thee: and the light shall shine upon thy ways" (Job 22:22, 27-28). No need to consult horoscopes, zodiac charts or astrological computations. "Trust in the Lord with all thine heart; and lean not unto thine own understanding. In all thy ways acknowledge him [not a horoscope! ], and he [not an astrologer's predictions!] shall direct thy paths" (Prov. 3:5-6).